Familylane: Happy Birthday October Babies! Time flies indeed and everyone born in October becomes a year older! I like to wish all the October babies Happy Birthday in accordance to the names of people found here as well as other family members found on this post. Some family members will be covered in this post. October 2nd was the first celebration. I was in Kuantan with Ern and Ray including a neighborhood friend from Singapore, David Ooi whom we call Uncle David. The day turned out to be a surprise double celebration as not only was it the birthday of my sister-in-law but also happened to be the day my 3rd brother received his official 'Datoship' title at the palace in Pekan. ...and the rest of the household. In the night time we had a nice dinner together. In blue at the front centre is my neighborhood friend Uncle David, who accompanied me on this latest road trip of mine. Seafood galore fully enjoyed by Ern and Ray! The woman on the right is Mira their house helper who has worked for the family for close to 10 years, like our Kak Tun from Java, who caught a live fish to be cooked in this same restaurant during the visit of Su and Jay in the summer of 2012, seen on this video. Thanks to facebook, connections to family are made easier to see that Su had a nice birthday surprise in the US in the post found here. 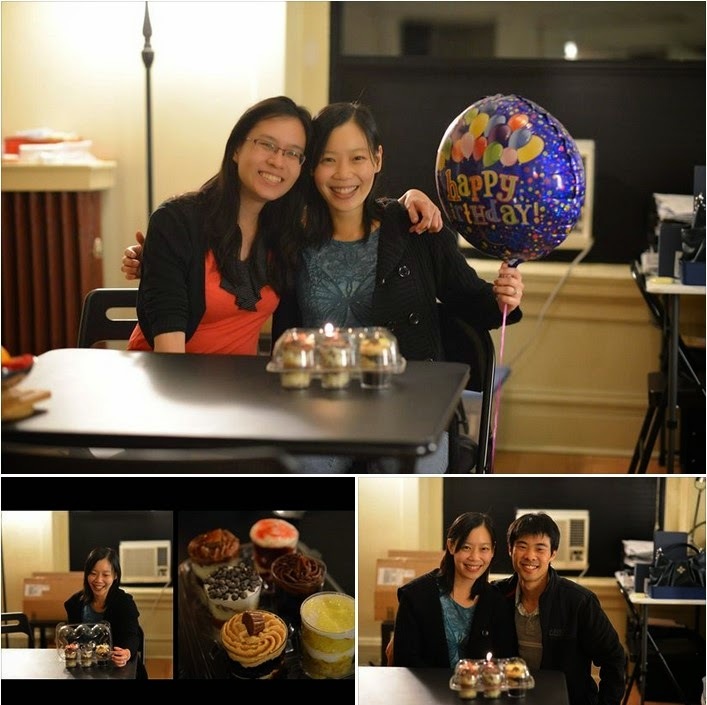 Happy birthday Su from all of us in familylane with love! 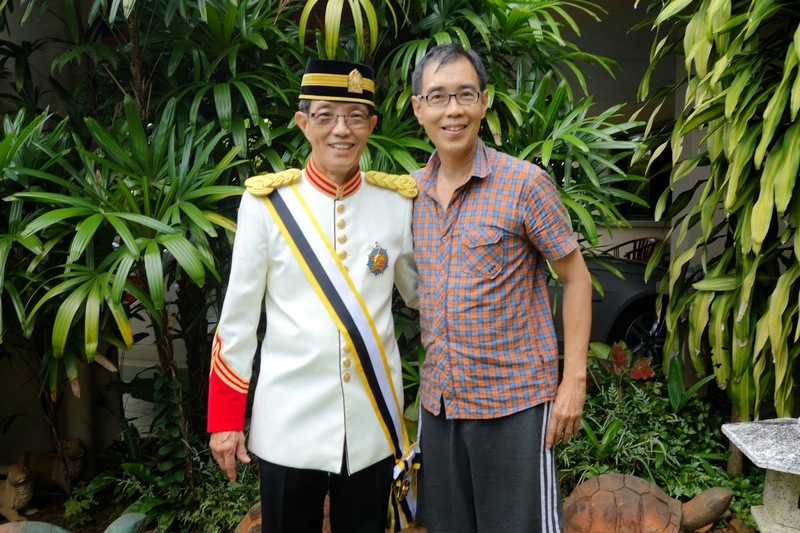 Interesting that earlier this year, I witnessed another member of our extended family wear the 'songkok', a traditional Malay head gear, for his appointment as a high court judge. He is the oldest son of my eldest sister from Penang who also celebrates his birthday on Oct 4th addressed as Yang Arif Lim Chong Fong. It's also interesting to note that early in the month of September, for some reason I picked up a 'songkok' to wear in a supermarket and made it my facebook profile pic for the month and it coincidentally turned out to match the pics and story that arose in this new blog post. 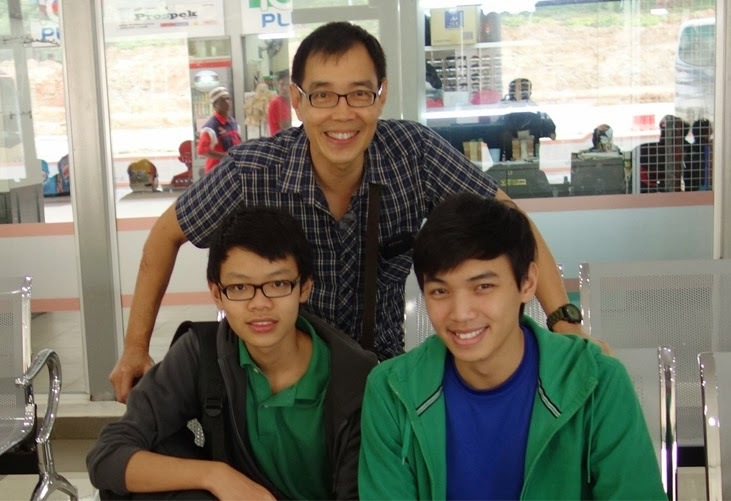 From Kuantan, the boys returned to Singapore while Uncle David and I headed to KL for a night on Saturday with plans to attend Church on Sunday morning and head north to Penang. 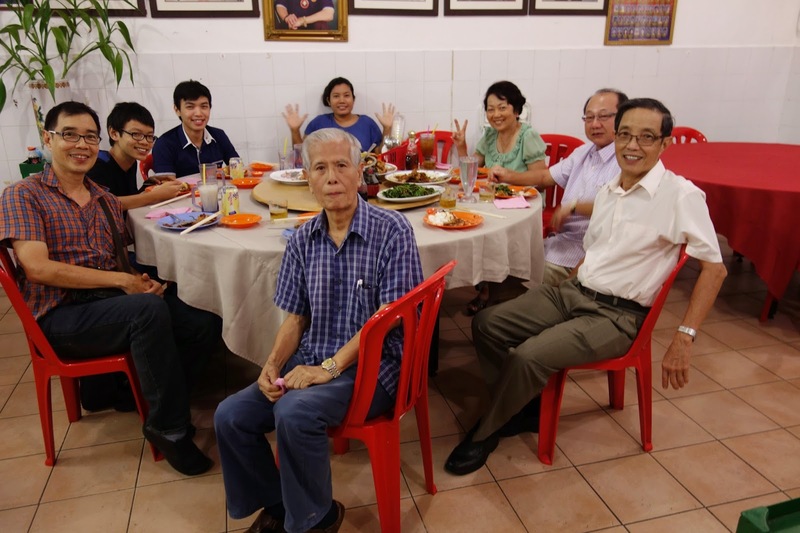 On arrival to KL, we were invited to join my oldest brother's family for dinner. His oldest son Woon Ming had had a marriage registration on Oct 1st with Jenny Liew where the Chinese dinner will be held on 24th December at the end of the year, a Christmas eve event! As I had not registered my birthday to be public on facebook, most are not aware of this date of my birthday. On Sunday morning, Han managed to create a birthday surprise for me with this facebook post found here that let the cat out of the bag as they would say! 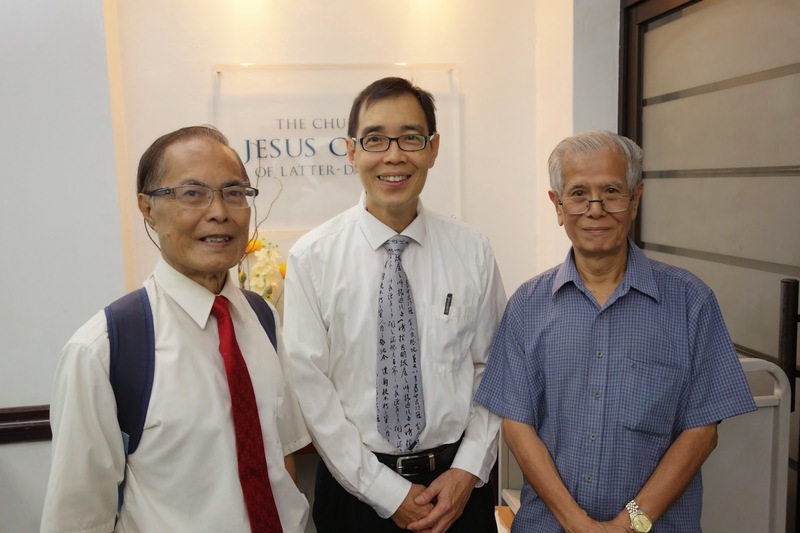 Anthony Lim on the left is in his early 70s, David on the right is a visitor with me in his late 70s and I'm in the middle in my middle 50s haha! With the Ravindra family where his wife Puvaneswari reminded me that I had baptized her in the early 80s. I remember teaching her but it's been a long time now to remember all whom I had baptized as sometimes it is my companion who did the baptism when we always teach as a pair. Chatted briefly with the Sisters noting that the one on the right is from Bristol, UK. 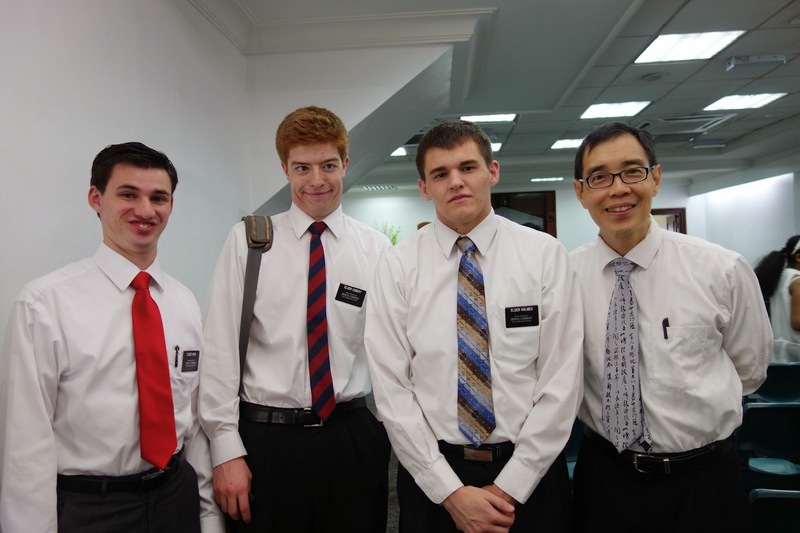 I guess any missionary from UK now attracts my attention after having Han serve in the UK himself. Colin and Judy Beard, a missionary couple from Darwin Australia whom we met in JB in June 2012 had returned for a visit after their mission. We met them half way in Ipoh as we were heading to Penang and they were coming from there to head to KL. 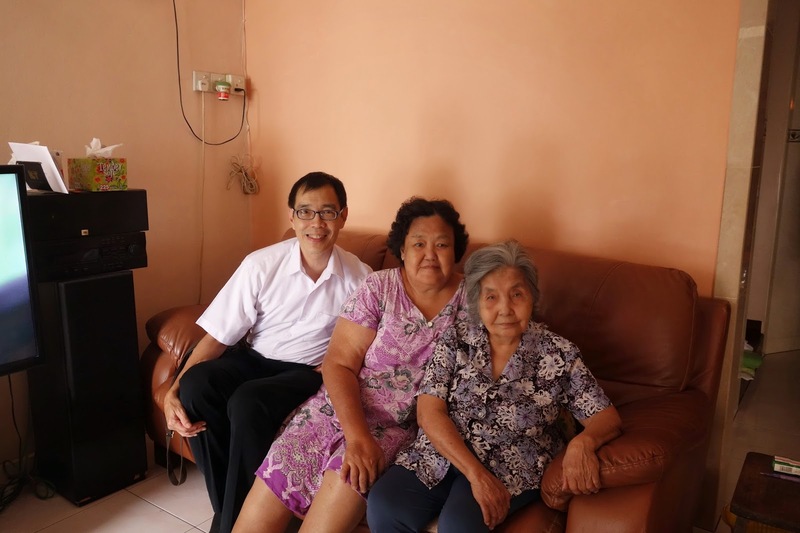 They are hosted by the Lokes in Ipoh, Doreen being our first convert in Ipoh whom my companion and I had taught in early 1981. Judy Beard happens to be an October baby too celebrating on Oct 7th! We continued our journey to Penang, using the new 2nd bridge to the island that seemed to be built on the sea for over 20km! 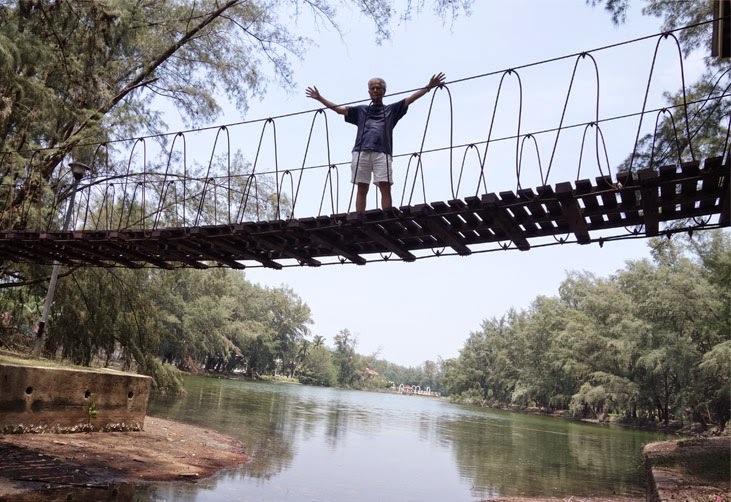 The exact figures according to wiki of the total length of the bridge is 24 km (15mi) with length over water at 16.9 km(10.5 mi), making it the longest bridge in Malaysia and the longest in Southeast Asia. First to introduce my friend David to our family members in Penang. At 77, I wanted him to feel young sitting beside my uncle 'Ah Cik' who turned 80 earlier this year. 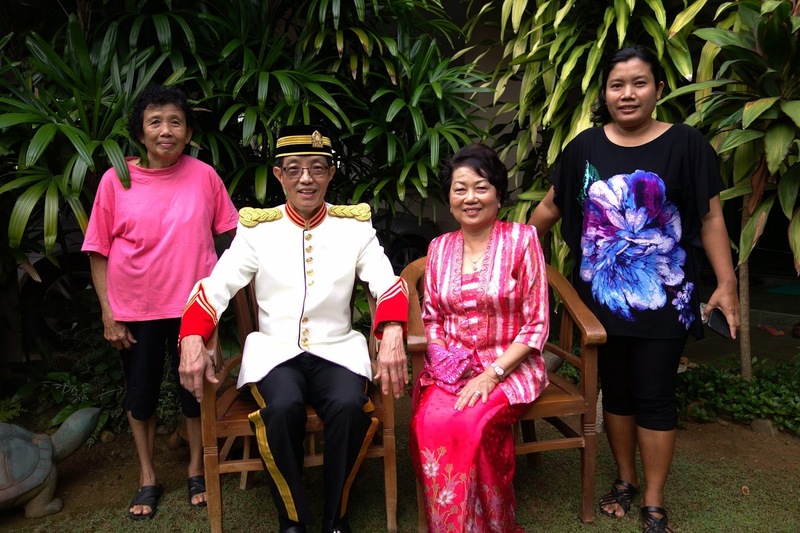 Here is my oldest sister Moon Lean with cousin Ee Choon who have contributed greatly to provide information of the Cheah family in Penang. 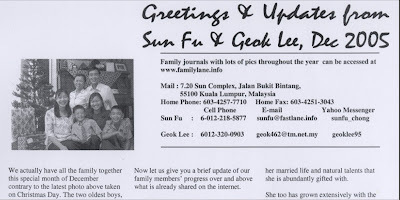 Seen above is Helen Khoo, another cousin who has been a key contact person in touch with most of the Cheah family members in Penang and others spread throughout Malaysia to down south Singapore. We as cousins got together at the home of Allan Cheah who made a post of our gathering in facebook. Of course anyone who visits Penang will enjoy the many stalls there selling delicious food. This particular stall is unique as the two men running it are always seen quarreling as I believe the cook is partially deaf and mixes up the orders given by the other. See them in action below, it's hilarious! Foggy and early Sunday morning, I started my drive to Ipoh crossing the 2nd link from Penang to the mainland. Better than the night drive when I first arrived, not seeing the water at all, this time round, I can get a sense of driving over water for about 17km this morning, connecting Batu Maung on the Island and Batu Kawan on the Mainland. The sun was out to clear the fog so that the beautiful architectural designed portion of the bridge could be visible from far. I was rushing to make it to the video conference of our Church General Conference at the Ipoh branch of the Church. I made it just in time for the Video Conference to start and sitting at the back, I recognized an old friend I knew in the KL Church who walked in late and recognized me when I said hello to him. He had a case of mental illness since his college days in KL and knew all our family members when we were in KL over 10 years ago. After he moved back to his home in Ipoh, we didn't see much of him but occasionally he would give me a phone call to chat a little or some times just exchange text messages. His state of mind seems to have taken a step backwards. He now talks to himself alone without focusing on the conference video projected on a large screen in the hall. After the meeting we went to Wooley's food court for lunch where I listened to him tell me which actor or actress is son or daughter of which famous personality. Like many of such 'special friends' I classify them as, some have fully recovered, some remain in their same state and others have regressed like my above friend. He isn't that bad still as he could order food and get drinks for me by himself. It was interesting to find out that the drink seller didn't come to collect money and when I went to the stall to pay, they said that at times they just served him for free but I thought I should pay them since I was the host. It's nice to know there are still kind people in this world. He could guide me back to where he stays without any problems so his regression really is only that he now talks to himself unlike before where he just didn't talk normal like others. Emotional problems have led many to suffer some form of mental illness and I've shared a success story of recovery here. With the always great looking Loke couple! 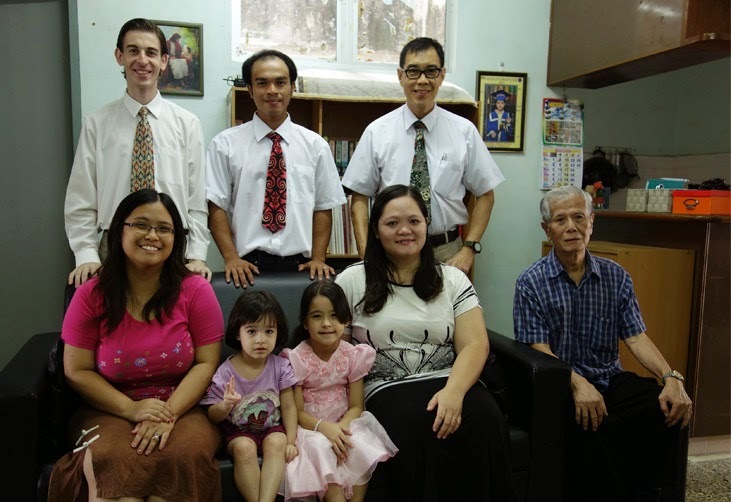 With former KL Church members like Theresa with husband Stewart Loke from my couple days with my wife who all have missionary sons as with Dominic on the right, son of Sophia Ho on the far left! A special moment with the family's Auntie Diana with her mother, the Mama Toh of Ipoh. Diana has been elevated to be Lady Diana in this post. Thank you again Lady Diana for your Birthday cards individually sent to our KL address to Han and I this month! I woke up early on Sunday morning with a goal to get a video clip done for Han for this blog post that I can share with him on facebook too. I had to select pics from my family photo files and create ideas how to present them. I was confident that with my computer storage of photos and my optimal brain for ideas, I could get the job done. The main challenge I knew was trying to use Microsoft's Movie Maker on my new notebook that was running on the latest Windows 8.1 which had a bug of no sound production since I had first tested it over 3 months ago but had no time to resolve the problem. Ray the youngest had woken up early and he was trying to do something online for his brother too. He became a witness for me of the miracle that occurred that morning. He knew I was struggling on my little project as I was talking out loud as I commonly do even on the facebook community lol. This little miracle reminds me that the same table where I sat by to make the video clip was the same table in Nov 2011 when Mom had just passed away and we felt she had switched off the power just at the moment we had lit the candles of the cake to celebrate the birthdays of Shuan and Jay together as recorded on this video. It is of course no coincidence the original video clip of Han above was taken in the same living room too! This whole spiritual experience considered as a miracle prompted me to change the criteria of what type of stories would be included in the Story of 7 and included it as the first to be posted there noted here. At the clean up time, Han at 24 thought he'd practice some on the wheel chair for his old age! Steam boat dinner was planned so no time would be wasted in cooking. A chicken was steamed for 2 hours before dinner time though. Here is a photo of all of us at the dining table ready to feast! After dinner the girls will join us for a google+ hangout to sing happy birthday for Han. 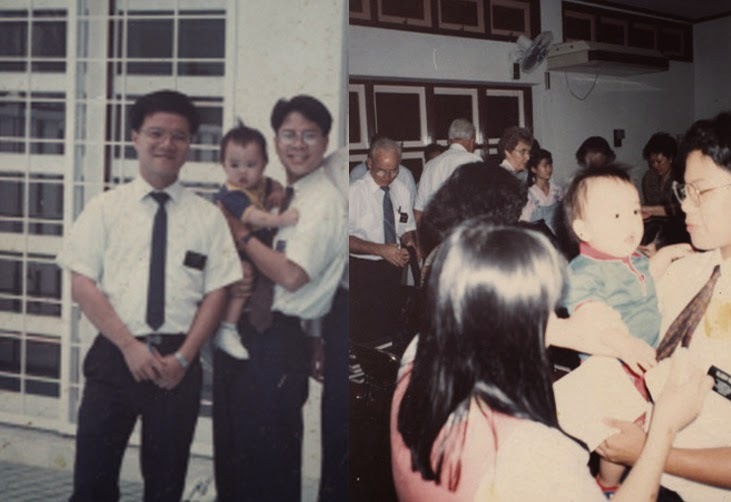 Right from the beginning of this blog post when we started celebrating birthdays in October, we didn't know Uncle David who was travelling with me in Malaysia was also an October baby. Soon I heard him mention it but I forgot the date. When I returned to Singapore, I checked his facebook and there were wishes in previous years to him on 19th Oct and another on 26th. October. I thought it was the 26th and bought him a bottle of non-alcoholic wine or grape juice to wish him at his home. He clarified with me that it was on the 29th of October so I wished him early and passed him his gift in advance.